After living abroad for 7 years, we’ve experienced a lot of things that are different, unique, out of our comfort zone… and it has become less and less frequent that I have a moment where I truly feel out of my element. It was fun this weekend to have one of those experiences right here in Seoul as I rode in a car elevator for the first time! Laura and I decided to drive to the north side of the city on Saturday for a foray into the baking district and fabric market. She knew from a coworker’s wife that one of the buildings had a parking lot on the roof. 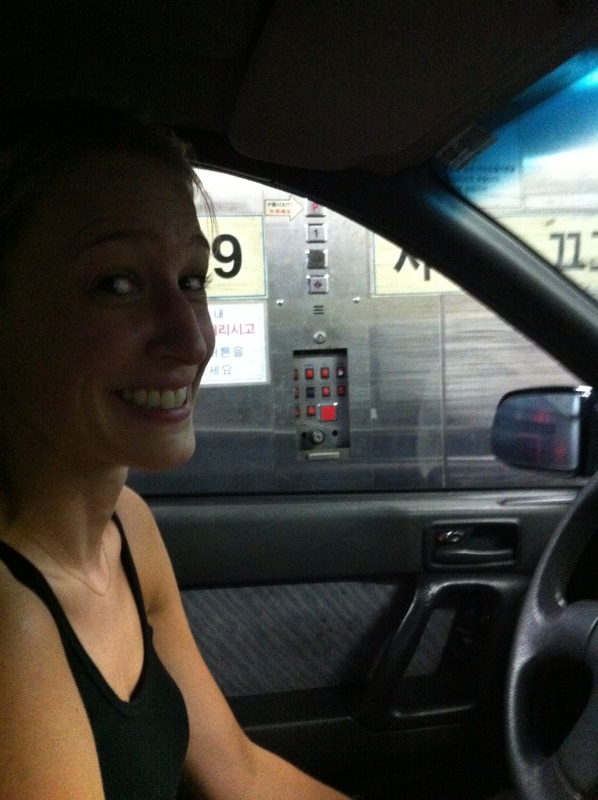 We pulled up and waited in line for our turn in the elevator (much like waiting at the car wash). When the doors opened, Laura pulled the car into the elevator, rolled down her window, pressed the elevator button and off we headed to the roof. Upon arrival, the elevator doors in front of us opened and we were able to pull right out and drive across a roof bridge to the next building to find an open-air parking spot. To many here in Korea, this might feel completely normal, but for me it was quite the thrill! The parking lot had a beautiful view of the city and the whole process of driving into an elevator was quirky and interesting. Posted in Korea, TidBit of the DayBookmark the permalink. Been to Korea and never even knew that was a thing. I like your blogs name!